A total of 26 graduates of the College of Veterinary Medicine (COLVET) of the University have participated in the 9th oath-taking and induction into the veterinary profession. Speaking at the occasion, which was themed, “Who is a Successful Veterinarian?”, the Guest Speaker and the Deputy Vice-Chancellor, Research, Innovation and Strategic Partnerships, University of Ibadan (UI), Professor Olanike Adeyemo, described the veterinarian among several definitions, as someone that is dedicated to caring for the health and well-being of animals and understands the interdependent relationships between animals, humans and the environment. Represented by the Sub Dean, Clinics, Veterinary Teaching Hospital (VTH) of UI, Dr. Adenike Olatunji-Akioye, she stated that there were 10 veterinary schools with about 70,000 veterinarians in Nigeria, adding that 75 per cent of veterinarians were employed in private practice and 25 per cent of them were either in government or other employment. 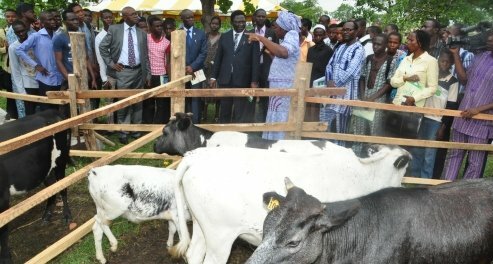 She highlighted available opportunities in Veterinary Medicine in Nigeria to include those of clinical practice; biomedical research; education; ministries, departments and agencies, adding that other major employers of veterinarians were the livestock farms, pharmaceutical industries in Nigeria, armed forces, Nigeria Police Force, Nigeria Custom Service, banks and insurance companies, among others. The Professor of Aquatic Epidemiology and Toxicology stressed that there were also opportunities for veterinarians in private practice, saying that the areas of interest of the individual would determine the scope of the business such as small animal clinics and poultry consultancy, to mention a few. The Don enjoined the graduands to have vision, sound knowledge, focus, determination, discipline and passion towards a successful private practice. The Acting Dean of COLVET, Dr. Michael Takeet, stated that since 2009, when the first set of Doctor of Veterinary Medicine (DVM) Degree holders graduated to date, the COLVET’s products had continue to do the University proud wherever they go, noting that “The Department of Veterinary Services, Ogun State Ministry of Agriculture recently employed about 20 veterinarians, out of which 15 were products of FUNAAB”. Congratulating the inductees, the Acting Dean said that “Today marks the beginning of another phase of your life. More than ever before, you would have to fend for yourself. To succeed in this and other areas of your endeavour, strive to be the best in whatever you lay your hands upon”, as he charged the inductees to be active and honest members of their communities, workplace and religious centres. The Vice-Chancellor’s keynote address was delivered at the Dean, College of Plant Science and Crop Production (COLPLANT), Professor Mufutau Atayese, who congratulated the inductees, parents and family members on the joyous occasion. Highpoint of the ceremony was the oath-taking and admission of the graduands into the veterinary professional body as well as presentation of certificates to the inductees. Present at the occasion were the representative of the President, Nigerian Veterinary Medical Association (NVMA), Dr. Teddy Essien and representative of the Acting Registrar, Veterinary Council of Nigeria (VCN), Dr. Adetola Adedeji. Others were former Deans of COLVET, Professor Reuben Arowolo; Professor Morenike Dipeolu and Professor Babatunde Otesile as well as the Director, Veterinary Teaching Hospital (VTH), FUNAAB, Professor Bayo Akinloye, among others.